[[File:Ciexample.jpg|thumbnail|right|200px|Alt=SSA|Covariance Intersection]] An elegant solution for the fusion of estimates with unknown correlations is the Covariance Intersection (CI) algorithm [Julier and Uhlmann, 1997]. As the name suggests, the CI algorithm is routed in the fiundamentals of Gaussian intersection. Appreciation for the CI algorithm is gained by considering the fusion of two estimates in 2D. In 2D the covariance of a Gaussian random variable can be interpreted as an ellipse. If multiple estimates of the same 2D state vector are available, their covariance ellipses will intersect as shown. 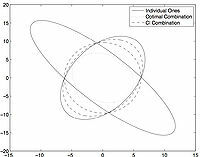 The CI algorithm expresses the covariance of the fused estimate as the smallest covariance ellipse which contains all of the intersection of the two individual covariances. Depending on the confidence in each estimate or a desired final statistic, each individual covariance can be weighted by a scalar value which leads the CI algorithm to include a family of solutions as shown. Andrle, M.S., and Crassidis, J.L., “[http://ancs.eng.buffalo.edu/pdf/ancs_papers/2012/geom_int.pdf Geometric Integration of Quaternions],” AIAA/AAS Astrodynamics Specialist Conference, Minneapolis, MN, Aug. 2012, AIAA Paper #2012-4421.